Regarding AUCTION #148 (Closing Date: Saturday, 15 April, 2017), The Minimum Bid ("MB") is a guide which has been set in accordance with current market value, determined through constant monitoring of auction sales during recent years. In cases of extreme rarity, the actual realized price may far exceed the Minimum Bid, while in other cases an item may realize a price very close to the Minimum Bid, and, occasionally, the Minimum Bid itself. Please simply bid in accordance with whatever a given item means to you. If a bidder wins more than originally anticipated, we are most pleased to make any mutually comfortable arrangement for payment terms. Please inquire. J0155. JOSEPH WOLFSTHAL, w.Weissmann Cond.Berlin Ensemble: Turkish Concerto #5 in A, K.219 (Mozart), 8s. 4-12” blue Viva-Tonal Col.G-67757/60-D, POM-1928 & 1929, in Orig.Album 137. M-A, as New (albeit album spine is slightly split). MB 65, the Set. J0158. PAUL KOCHANSKI & ARTHUR RUBINSTEIN (Pf. ): Sonata #3 in d (Brahms), 6s. 3-12” Orth V 8483/85, on ‘Z’ shellac, POM-15 June, 1932, in Orig. Album M-241. M-A MB 65, the Set. "At the height of his career, Kogan interpreted the great classical concertos (notably Beethoven and Brahms) with power, nobility, and an admirable feeling for stylistic purity. He always avoided flamboyant effects, and was rather reticent on stage. His tone was lean, with a tight and sparse vibrato, his intonation infallibly pure, his technical command superb. All these qualities can be heard on the many recordings he made between 1950 and 1970." 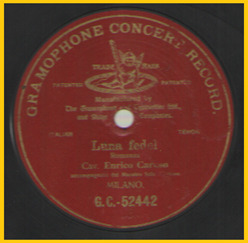 “The recordings Dinicu made for Columbia in 1927–1928 reveal a powerful and well-projected sound, garnished with a very wide vibrato together with prominent and slow portamenti in more melodic passages. In faster passagework his tone is clear and vibrant, allowing a considerable variety of colour, whilst his trills and ornamental passagework are scintillatingly delivered….Dinicu’s style makes an interesting juxtaposition with that of Jenö Hubay, director of the Budapest Academy, who, although from an arguably more ‘elevated’ artistic position, embodies recognisable elements of Dinicu’s sound-world. J0179. GERHARD TASCHNER: Partita #2 in d - Chaconne (Bach), 4s. 2-12” brown German Odeon O-8764/65 (xxB8893-96), POM-25 & 28 Nov., 1941. A-, lovely copy has lt.rubs & occasional mk, inaud. MB 145, the Pair. “Two years after graduating from the Prague Conservatory Kubelík received a hero’s welcome from the London public, playing at Richter’s invitation. Audiences found him as appealing as the likes of Paganini and Paderewski….He was celebrated for his virtuosity, richness of tone and faithful intonation. Kubelík was amongst the earliest world-class violinists to make solo recordings….Gramophone and Typewriter recorded Kubelík and Nellie Melba in 1904: the understated obbligato rôles in Mozart’s ‘L’amero saro costante’ and the Bach-Gounod ‘Ave Maria’ demonstrate a rather more tender side to his playing with the emphasis on purity of tone and close parity with Melba’s vocal sound. The early ‘Ave Maria’ recording quickly became a widely accepted classic and was re-recorded twice in 1913, following technological advances. J0191. GEORGES ENESCU, w.Sanford Schlussel (Pf. ): Poème (Chausson), 2s. 2-12” dark-blue Eng. Col. DVX 5/6, POM-1929. M-A MB 125, the Pair. J0192. GEORGES ENESCU, w.Sanford Schlussel (Pf. ): Sonata #14 in D (Handel), 2s. 2-12” blue early PW Col.5110/11, POM-1929. M-A, as New! MB 125, the Pair. J0207. BRONISLAW HUBERMAN, w.Dobrowen Cond.Vienna Phil. : Concerto #1 in a (Bach), 4s. 2-12” PW Col.70462/63, POM-1934, in Album MX 45. M-A MB 15, the Set. J0208. BRONISLAW HUBERMAN, w.Dobrowen Cond.Vienna Phil. : Concerto #2 in E (Bach), 5s. 3-12” MasterWorks Col.68376/78, POM-1934, in Album 235, w.Brochure. M-A MB 25, the Set. J0209. BRONISLAW HUBERMAN, w.Dobrowen Cond.Vienna Phil. : Concerto #3 in G, K.216 (Mozart), 6s. 3-12” MasterWorks Col.68548/50, POM-1934, in Album 258, w.Brochure. M-A MB 25, the Set. J0210. BRONISLAW HUBERMAN, w.Steinberg Cond.Berlin Staatsoper Orch. : Concerto in D, 7s / Sd.8 = BRONISLAW HUBERMAN, w.Siegfried Schultze (Pf. ): Mélodie in E-flat (both Tschaikowsky). 4-12” blue Viva-Tonal Col. 67726/29-D, both POM-16 Aug., 1929. A to M-A, lovely copy has faintest rubs, inaud. & hardly worth mention. MB 20, the Set. J0211. BRONISLAW HUBERMAN, w.Szell Cond.Vienna Phil. : Symphonie Espagnole (Lalo), 6s. 3-12” PW Col.68288/90-D, POM-1934, in Album M 214. M-A MB 15, the Set. J0221. CARL FLESCH & JOSEPH SZIGETI, w.Goehr Cond. : Concerto in d for Two VIolins (Bach), 4s. 2-12” MasterWorks Col. 69109/10-D, POM-30 Aug., 1937, in Orig. Album X-90. M-A, a gleaming copy of preferred MasterWorks pressing. MB 25, the Set. J0222. MISCHA ELMAN, w.Wolfgang Rosé (Pf. ): A Tribute to Mischa Elman on his 40th Anniversary, incl. Beethoven, Drigo, Gossec, Drdla, Arensky & Cui. 3-10" RCA 10-1491/93, only form of issue, 1949, in Orig. Album DM 1328. M-A MB 35, the Set. "I was eleven at the time. When Colonne saw me, violin in hand, ready to step on the stage, he drew himself up and said with emphasis: 'I play with a prodigy! Never!' Nothing could move him, and I had to play to a piano accompaniment. After he had heard me play, though, he came over to me and said: 'The best apology I can make for what I said is to ask you to do me the honor of playing with the Orchestre Colonne in Paris’. He was as good as his word. Four months later I went to Paris and played the Mendelssohn concerto for him with great success." J0237. JASCHA HEIFETZ, w.Barbirolli Cond. London Phil. : Concerto in a, 5s. / Sd.6 = JASCHA HEIFETZ, w.Árpád Sándor (Pf. ): Méditation, Op.32 (both Glazounov). 3-12" Orth Vla 8296/98, POM-28 March, 1934, on ‘Z’ shellac, in Orig.Album M 218, .Brochure. M-A, as New! MB 25, the Set. J0238. JASCHA HEIFETZ, w.Barbirolli Cond. London Phil. : Concerto in d (Sibelius), 8s. 4-12" Scroll V 14016/19, POM-26 Nov., 1935, on ‘Z’-type shellac, in Orig.Album M 309, w.Brochure. A to M-A, beautiful copy has faintest rubs, inaud. MB 25, the Set. J0239. JASCHA HEIFETZ, w.Emanuel Bay (Pf. ): Sonata #26 in B-flat, K.378; Sonata #32 in B-flat, K.454 (erroneously printed as Sonatas Nos.10 & 15) (Mozart), 10s. 5-12” Scroll V 14331/35, POM-3 / 10 Feb., 1936, on ‘Z’-type shellac, in Orig. Album AM-343, w.Brochure. M-A, as New! Reviewer’s Copy (reviewer’s ‘X’ on labels). MB 25, the Set. J0241. JASCHA HEIFETZ, w.Barbirolli Cond. London Phil. : Concerto #2 in d, 5s / Sd.6 = JASCHA HEIFETZ, w.Árpád Sándor (Pf. ): Scherzo tarantelle (both Wieniawski). 3-12” Scroll V 8757/59, POM-18 March, 1935 / Feb., 1934, on ‘Z’-type shellac, in Orig. Album M-275, w.Brochure. M-A, as New! MB 35, the Set. J0242. JASCHA HEIFETZ, w.Barbirolli Cond. London Phil. : ‘Turkish’ Concerto #5 in A, K.219 (Mozart), 8s. 4-12" Scroll V 8601/04, POM-Feb., 1934, on ‘Z’ shellac, in Orig. Album M 254, w.Brochure. M-A, as New! MB 25, the Set. – Christopher M. Wright (referencing Thomson ‘s notorious 1940 ‘Silk Underwear Music’ review). J0246. YEHUDI MENUHIN & GEORGES ENESCU; (Vlns); Monteux Cond. Paris Conservatoire Orch. : Concerto for Two Violins in d (Bach), 4s. 2-12" Scroll V 7732/33, POM-4 June, 1932, on ‘Z’ shellac. A to M-A, lovely copy has faintest pap.rubs, inaud. MB 25, the Pair. J0247. ALBERT SPALDING, w.André Benoist (Pf. ): Sonata in A (Franck), 8s. 4-12" Scroll V 8278/81, only form of issue, 1 Feb., 1934, on ‘Z’ shellac. M-A, as New! MB 65, the Set. "The vibrato is, perhaps, the most personal element of the violinist's playing, the most important factor influencing the character of his tone, in giving it individuality. Just as the great master-painters can be recognized without the signature on their canvasses, by distinctions of line and composition, so, I believe, our great violinists can be distinguished by the peculiar quality of their vibrato." J0250. FRITZ KREISLER, w.Blech Cond. Berlin Staatsoper Orch: Concerto in D (Beethoven), 11s. / Sd.12 = FRITZ KREISLER: Sonata #1 in g – Adagio for Violin Unaccompanied (Bach). 6-12” Scroll V 8138/43, POM-Dec., 1926, on ‘Z’ shellac. M-A, as New! MB 85, the Set. J0251. FRITZ KREISLER, w.Blech Cond. Berlin Staatsoper Orch. : Concerto in D (Brahms), 9s. / Sd.10 = FRITZ KREISLER, w.Raucheisen (Pf. ): Romance in A (Schumann). 5-12” Scroll V 8115/19, POM-Nov., 1927, on ‘Z’ shellac. M-A, as New! MB 85, the Set. J0252. FRITZ KREISLER, w.Blech Cond. Berlin Staatsoper Orch. : Concerto in e, 7s. / Sd.8 = FRITZ KREISLER, w.Árpád Sándor (Pf. ): SONGS WITHOUT WORDS – May Breezes (both Mendelssohn). 4-12” PW Electrola DB997/1000, POM-Dec., 1926, in Orig. Electrola Album M-19, w.Brochure. A to M-A, beautiful copy has occasional faint rubs, inaud. MB 65, the Set. J0260. JACQUES THIBAUD, w.Harold Craxton (Pf. ): Sérénité (Vieuxtemps) / Slavonic Dance #1 in g (Dvorák). 10” Vla 976, POM-6/7 Feb., 1922. M-A, beautiful copy has, alas, fine hlc. MB 15, as is . . .
J0261. JACQUES THIBAUD & ALFRED CORTOT: Sonata in A (Franck), 8s. 4-12” Vla 6524/27, POM-1923 & 1924. M-A Exceedingly Rare, this AC Issue enjoyed a very brief catalogue life and was superseded by the 1929 EL Version. M-A, beautiful copy has, Sd.3 only, infinitessimal pap.scr, positively inaud., hardly worth mention. MB 150, the Set. J0266. OSCAR SHUMSKY, w.Bernard Greenhouse (Cello): Sonata for Violin & Cello (Ravel), 4s. 2-12” vinyl Concert Hall 1219/22, POM-1950, in Orig. Album B 4. M-A MB 35, the Set. J0267. OSCAR SHUMSKY, w.Artur Balsam (Pf. ): Sonata for Violin & Piano in b (Respighi), 6s. 3-12” vinyl Concert Hall 1213/22, POM-1950, in Orig. Album B 15. M-A MB 35, the Set. “Oscar Shumsky, a violinist and conductor who was renowned for the beauty of his sound and the luminous musicality of his performances of Bach, Mozart and Brahms, was one of the last students of Leopold Auer, the legendary Russian violinist who also taught Jascha Heifetz, Mischa Elman and Efrem Zimbalist. When Auer died in 1930, Zimbalist took over Shumsky's training and reinforced the grandly Romantic, communicative interpretive style that was the principal hallmark of the early 20th-century Russian violin school. Although he never became a household name on the order of Heifetz, he commanded tremendous respect among musicians throughout his career, not only for his solo performances but also for the passion he brought to chamber music and orchestral playing. That quality was something he passed on to many of his students, who included Eugene Drucker and Philip Setzer of the Emerson String Quartet; Ida Kavafian; Eliot Chapo, a former concertmaster with the New York Philharmonic and Guillermo Figueroa, the concertmaster of the New York City Ballet Orchestra. Mr. Shumsky was born in Philadelphia on 23 March, 1917, and began studying the violin with Albert Meiff when he was 4. When he was 8, he played a concerto at a Philadelphia Orchestra youth concert conducted by Leopold Stokowski, and that same year he began his studies with Auer, at first privately in New York and later at the Curtis Institute of Music in Philadelphia. Mr. Shumsky studied at Curtis until 1936, and he continued to work privately with Zimbalist until 1938. By then, he was a seasoned professional, having performed the Brahms and Elgar concerti with the Philadelphia Orchestra on tour in 1932. In 1939 he joined Toscanini's orchestra, the NBC Symphony, where he met the violist William Primrose. Mr. Shumsky became the first violinist in the Primrose Quartet, which made several classic recordings in the early 1940s. J0270. LOUIS KAUFMAN, w.Rachmilovich Cond. Santa Monica S.O. : Concerto #3 in b (Saint-Saëns), 6s. 3-12” Disc 4120/22, only form of issue, 1945, in Orig. Album 805. M-A MB 25, the Set. J0271. LOUIS KAUFMAN, w.Rachmilovich Cond. Santa Monica S.O. : Concerto in D (Khachaturian), 8s. 4-12” vinyl Concert Hall 1173/80, POM-1946, in Orig. Album AN. A to M-A, lovely copy has faint rubs, inaud. MB 25, the Set. J0272. LOUIS KAUFMAN, w.Henry Swoboda Cond. : Concerti delle Stagioni (Vivaldi), 12s. 6-12” vinyl Concert Hall 1375/86, POM-1950, in 2 Orig. Albums AR 1 & 2. M-A MB 45, the Sets. J0334. MARCEL HUBERT, w.Shura Cherkassky (Pf. ): Sonata in g (Rachmaninoff), 7s / Sd.8 = MARCEL HUBERT, w.Harold Dart (Pf. ): GOYESCAS – Intermezzo (Granados). 4-12" early Col. 68343/46-D, POM-1934-35, on Royal Blue Shellac, in Orig. Album 225. M-A, as New! MB 35, the Set. J0340. MAURICE MARECHAL, w.Bigot Cond. Lamoureux Orch. : Cello Concerto in c (J.C. Bach), 4s. 2-12” French Col. LFX 774/75, POM-1948. M-A, superlative copy has tape affixed Sd. 2 label. MB 25, the Pair. J0341. MAURICE MARECHAL, w.Gaubert Cond. : Concerto in d (Lalo), 6s. 3-12” PW Japanese blue Viva-Tonal Col. J 8133/35, POM-1932, in Orig.Album 133. A to M-A, lovely copy has occasional faintest rubs, inaud. MB 35, the Set. J0343. EMANUEL FEUERMANN: Suite in G for Cello Unaccompanied (Reger), 4s. 2-12” PW Col. 69787/88-D, POM-7 Feb., 1939, in Orig. Album X-152, w.Brochure. M-A, as New! MB 25, the Set. "I place Feuermann as the most important figure for 20th-century cello playing because he was the one who proceeded to carry cello playing as such to a higher level. If he had lived longer he would literally have taken the place of Casals." J0355. FELIX SALMOND, w. Simeon Rumschisky (Pf. ): Sonata in A, Op.69 (Beethoven), 6s. 3-12" blue Viva-Tonal Col. 67187/89-D, POM-18 Jan., 1926, in Orig.Album 38, w.Brochure. M-A, as New; Sd.6 has minuscule pressing bump. MB 35, the Set. J0356. FELIX SALMOND, w. Simeon Rumschisky (Pf. ): Sonata in a, 7s. / Sd.8 = To Spring (both Grieg). 4-12" blue Viva-Tonal Col. 67360/63-D, POM-13 & 17 May / 5 Oct., 1927. A to M-A, lovely copy has faintest rubs, inaud. MB 35, the Set. J0357. FELIX SALMOND, YELLY d’ARANYI & MYRA HESS: Trio #1 in B-flat (Schubert), 8s. 4-12” dark-blue PW Eng. Col. 9509/12, POM-28-30 Dec., 1927. M-A, lovely copy has faintest pap. rubs, inaud. MB 25, the Set. “Elgar entrusted to Salmond the premiere of his most personal and heartfelt work, the Cello Concerto. The premiere, 27 October, 1919, is a day that has become a shameful day in British musical history. The conductor, Albert Coates, conducted the rest of the program, but Elgar led the concerto. Coates, a self-important man, was known to use as much as the first three quarters of an hour of his rehearsal time lecturing his orchestral players. Elgar, waiting off stage to rehearse his own work, uncharacteristically exploded when Coates consumed an hour of Elgar's rehearsal time. Elgar said later that had Salmond not have been conscientiously working on the concerto for months, he would have withdrawn the work from the concert. The work was severely under-rehearsed. Fifty years after that occasion, the commentator S.S. Dale, wrote for the string players' magazine THE STRAD, ‘It does not speak much for English audiences that Salmond never had his due in England; and to be recognized at his true worth he had to emigrate to the United States, where he was responsible for the training of many of America's finest cellists today’. He stressed use of the arm rather than the wrist in crossing strings, again, a violin-like technique. He used the thumb, not pressure from the arm, as the source of power in the bow-stroke. This resulted in a less nasal, much more beautiful tone, and he consistently urged the student to strive for a beautiful tone. His recordings do show a lovely, singing tone." J0387. PABLO CASALS, w.Otto Schulhof (Pf. ): Sonata #3 in A, Op.69, 5s. / Sd.6 = Minuet in G (both Beethoven). 3-12” Scroll V 7571/73, POM-6 / 7 March, 1930, on ‘Z’ shellac. M-A, as New! MB 45, the Set. J0396. PABLO CASALS, w.Horszowski (Pf. ): Sonata #4 in C, Op.102, #1 (Beethoven), 4s. 2-12” PW V 14366/67, POM-1937. A to M-A MB 15, the Pair. J0397. PABLO CASALS, w.Horszowski (Pf. ): Sonata #2 in F (Brahms), 8s. 4-PW V 14699/14702, in Orig. Album M 410, w.Brochure. M-A, as New! MB 35, the Set. J0398. CASALS & THIBAUD; Cortot Cond. Barcelona S.O. : Double Concerto in a (Brahms), 8s. 4-12” Orth Vla 8208/11, POM-1 May, 1929, Orig. Album M-99. M-A MB 35, the Set. J0402. SERGE KOUSSEVITZKY (String Bass), w.Pierre Luboshutz (Pf. ): Valse miniature; Chanson triste; Concerto in f - Andante (all Played by the Composer) / Wiegenlied (Laska); Sonata - Largo (‘Take’ 1 ) (Eccles), 6s. 3-12" red vinyl RCA 99-2000/02, partially POM-1929, in Orig. Limited Edition Album LE-1. M-A, as New! MB 75, the Set. "...bowing to the pressure from the public, [Koussevitzky] allowed [three of the above pieces] to be made part of a 78rpm album LE-1, a deluxe collector's edition of 1,000 copies only, pressed on 12" transparent red vinyl discs and issued in commemoration of his 25 years of service to the BSO....he allowed the release of the 1929 recordings only as an accommodation to his friends and fans."